When building a custom drum set, you’ll use lots of tools, but these are the 4 tools that will make building a drum much easier! This also makes assembling drums extremely fast. 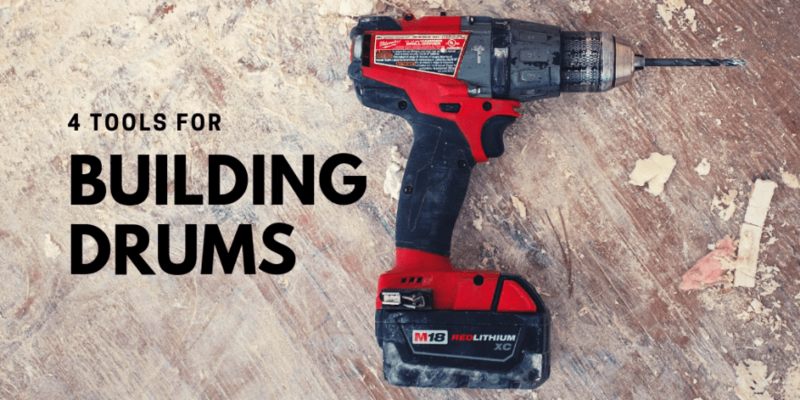 However when your screwing in any of your hardware screws (lugs, bass drum spurs, tom mounting hardware) you’ll need to use a low force setting on the drill so it doesn’t strip your screws. The reason I recommend a right angle drill is to be able to get inside those smaller diameter shells like 12″ and smaller. With a traditional drill you won’t be able to fit it inside the shell to screw the lugs screws in! If you are going to apply a wrap to a drum, this tool will help you get any unwanted air bubbles out from in between the shell and the wrap. This really is a must for applying wrap correctly. Ah, the combo square, probably my most used drum making tool. I use this to mark the layout for all of the hardware that goes on to each drum. I also use it to mark stripe layout for paint, and for wrap. I don’t know that I could build a drum without one of these. These are some of the tools that you’ll need to build a custom drum, to learn how to use some of them you can sign up for the free drum building tutorials sent to your email (click the banner below). If you want to learn how to use all of these drum building tools and learn the art of drum building consider buying the Drum Building Suite! I’m always looking for new blog topics so if you have any questions or ideas for blog topics I encourage you to leave a comment below!